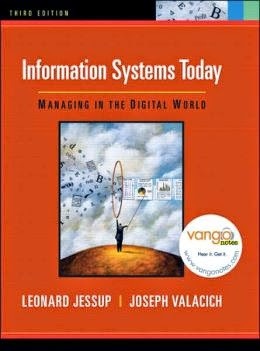 Information Systems Today: Managing in The Digital World. 2008. Leonard M. Jessup & Joseph S. Valacich. Hardcover: 410 pages. Publisher: Pearson Education International. Language: English. ISBN-10: 0130094145. ISBN-13: 978-0130094148. Product Dimensions: 10.7 x 9.1 x 0.9 inches.